In two separate cases the EPA has fined North Dakota and Colorado contractors for alleged violations of the lead-based paint Renovation, Repair and Painting Rule (RRP Rule). The three North Dakota home renovation companies, JH & JH Properties (Fargo), Clooten Siding & Window (Bismarck), and Buechler Construction (Bismarck) reached a settlement after joint inspections by the EPA and the North Dakota Department of Health in 2015 to evaluate compliance with the rule at job sites throughout Fargo and Bismarck. Under the terms of the settlements, JH & JH Properties will pay $2,000, Clooten Siding & Window will pay $2,800, and Buechler Construction will pay $2,100 to resolve alleged violations. These include conducting work on homes built before 1978 without being an EPA RRP-certified firm; failure to inform property owners and the public of potential lead hazards; failure to have a properly trained RRP-certified renovator assigned to the project; inadequate records demonstrating RRP compliance; and, the failure to follow lead-safe work practices to minimize potential exposure. Further south, the EPA also reached agreements with two Denver-area contractors, KSK Builders LLC and HomeWrights LLC, resolving alleged violations of the lead RRP rule. According to the EPA, "the first settlement, KSK Builders LLC agreed to pay a $2,000 penalty to settle allegations that the firm conducted exterior renovations on a pre-1978 home in Denver without being an EPA RRP-certified firm and without establishing the required records of compliance with the RRP Rule. The second settlement alleges HomeWrights, LLC conducted a renovation, including replacement of windows, on a pre-1978 home in Denver without being an EPA RRP-certified firm, without assigning a properly trained certified renovator, and without establishing the required records of compliance with the rule. The firm has agreed to pay a $9,400 penalty to resolve the alleged violations and has since become a RRP-certified firm. The settlements announced today are part of an ongoing initiative to protect northeast Denver communities from toxic lead paint hazards during home renovations. Most homes in these neighborhoods were built before lead was banned from use in paint products in 1978 and there is a high potential these homes may contain lead paint. The EPA initiative is focused on increasing awareness of the RRP requirements among both contractors and residents, as well as creating a strong deterrent for violators of the RRP Rule. Infants, children, and pregnant women are especially vulnerable to lead paint exposure, which can, even at low levels, cause lifelong impacts including developmental impairment, learning disabilities, impaired hearing, reduced attention span, hyperactivity and behavioral problems. Despite its ban from the U.S. in 1978, EPA estimates that lead-based paint is still present in more than 30 million homes across the nation." Denver Press Release and North Dakota Press Release. Avoid fines and protect your community! 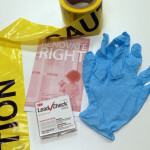 Sign up for EPA Lead Renovator (RRP) Initial and EPA Lead Renovator (RRP) Refresher courses. New York Energy Week is THIS WEEK!